Cruise on Merdeka 3 our 100 ft Indonesian Phinisi Yacht. 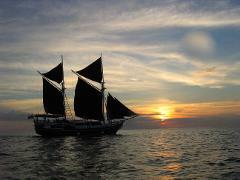 4 Day / 4 Night Semi Private cruise visiting Phi Phi, Krabi and Racha Islands. 2 Dives a day allows a well balanced dive and explore / chill holiday. Cruise on Merdeka 3 our 100 ft Indonesian Phinisi Yacht. 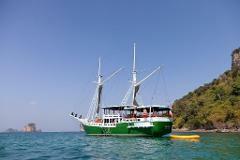 3 Day / 3 Night Semi Private cruise visiting Phi Phi, Krabi and Phang Nga Bay. 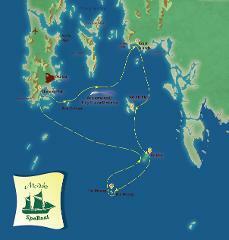 This is a great way to see the main highlights of the islands east of Phuket . Trip will leave Chalong Pier at 9:30 on Thursday and return on Friday at 17:30. Get to see Phi Phi is a relaxed and chilled way. Get a chance to sample Phi Phi Nightlife whist cruising. A Day / Dinner cruise running from Chalong Pier in the South of Phuket. Mid-morning pickup, lunch on the way to Koh Mai Thon, Snorkeling and Swimming all afternoon. Move to Coral island or Yanui Beach for the sunset and dinner.